Royal Bank of Scotland has reported profits of £1.62bn for 2018, more than double the £752m it made a year earlier. RBS chief Ross McEwan called the results "a good performance in the face of economic and political uncertainty". Mr McEwan said the UK economy faced "a heightened level of uncertainty related to ongoing Brexit negotiations". He told the BBC that Brexit could have a bigger impact on the economy than the Bank of England has suggested. Mr McEwan said: "Larger corporations are pausing on their investments. And this cannot be good for the economy long-term because those large corporations then employ smaller businesses and individuals. "If this goes on for a long period of time we're going to see the economy slowing down more than the Bank of England suggested. "We have a very small period of time left until the end of March and it's time that our politicians got to the conclusion so that we can get some certainty going forward." He said that 2018 saw benign economic conditions continue, with low defaults by customers on their loans. But the bank's statement noted the potential impact of "ongoing political uncertainties and geopolitical tensions" which could affect its customers, and, as a result, defaults were expected to increase this year. Asked how the bank is preparing for a no deal Brexit, Mr McEwan told the BBC: "For those businesses that are a bit concerned they may have to pre-buy a number of raw materials for their production, we've put aside £3bn for what we call a Growth Fund". RBS said NatWest had lent or approved £1.9bn to UK businesses to deal with Brexit (out of a possible £3bn). This could be to stockpile, find new suppliers or to secure trade financing. The bank was rescued by the government in 2008 in the aftermath of the financial crisis at a cost of £45bn and it still owns 62% of the company. In October, RBS paid its first dividend to shareholders since its bailout. In its latest results, the bank announced a final dividend of 3.5p per share, and also a 7.5p special dividend, which means the Treasury is set to receive £977m. While the government is still RBS's main shareholder, it also has about 190,000 private investors. The government has been selling off blocks of shares it owns in the bank, and aims to have sold all of its stake by 2024. But it realises a loss every time it does this as it paid 502p a share and they have not yet returned to that level. RBS shares are currently trading at about 240p. After RBS's near-death experience a decade ago, this looks like a very different bank. It's a lot smaller, having sold off large chunks. It also seems to have largely dealt with the financial consequences of its past bad behaviour. RBS hasn't had to set aside more cash to pay for PPI compensation this year. 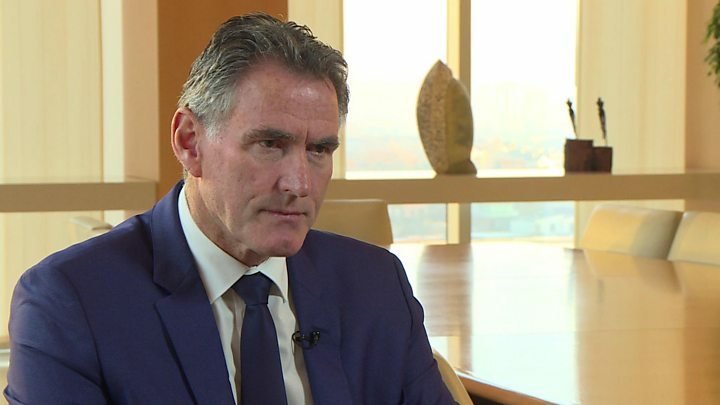 The boss of RBS, Ross McEwan, says the bank is pretty much fixed. That doesn't mean taxpayers are about to get all of their £45bn bailout cheque paid back. Despite the bank's rising profits, we'll probably still own part of it for a few more years yet. And even when we no longer have a stake in RBS, few expect the Treasury to break even. There's also the chance that political events could knock plans to sell off the public stake. The bank is warning of the economic consequences of a no deal Brexit. Mr McEwan says a deal needs to be done by the end of March. If not, he says the economy would take a hit. That could mean a rise in bad loans for the bank. That wouldn't be good for RBS's recovery. RBS has continued with its plan to shrink itself. Its assets, which in banking largely means its outstanding loans, shrank from £738.1bn to £694.2bn. Before the financial crisis, it was briefly the largest bank in the world by assets. The bank said the switch from physical to digital services was continuing to grow rapidly with 6.4 million customers now regularly using its mobile app, a 16% rise from 2017. But it gave a severe assessment of the risks presented by cyberattacks. It said such attacks were increasing in frequency, sophistication, impact and severity. Competition in the mortgage market meant profit margins remained thin, it said. Its net interest margin - the difference between what it pays for deposits and what it charges for loans, and a key measure of a bank's ability to make money - shrank to 1.98% from 2.13%. Profits may have doubled, but there is little to cheer for RBS in the latest official customer satisfaction rankings. The Royal Bank of Scotland brand was the bottom of 16 banks for overall service quality for personal customers in Britain, and 13th out of 14 for satisfaction among small business account holders. Stablemate NatWest, also part of the RBS group, was in the bottom half of both league tables. The rankings are drawn from the views of 16,000 people (1,000 from each bank) and nearly 20,000 small businesses asked how likely they would be to recommend their personal current account provider to friends and family. Fewer than half (47%) of Royal Bank of Scotland personal current account customers said they would recommend the bank. The results are revealed by the Competition and Markets Authority every six months, with the latest published on Friday. The aim is to encourage competition between banks on customer service. Metro Bank topped the league for personal customers and Handelsbanken was ranked the best by small businesses.